Some people would probably say that is false to call this dish fish and chips, since it doesn’t consist of any fish what so ever. I could have made up a whole new name (tofish?) or just have called it fried tofu and seaweed with root vegetables. But that wouldn’t have been quite true to the dish. Because it has the feeling and the look of fish and chips, and some how the flavours as well. I used dried kelp in the tofu, that I soaked and mixed for a few seconds before I added the tofu. I think any other kind of dried seaweed should work just as well. If you happen to find powder that is probably the best to get it evenly distributed. When I started thinking about making a vegan version of fish and chips, and to match tofu with seaweed to get something similar to fish, I wasn’t expecting that it would turn out as well as it did. By mixing the right amount of seaweed with the tofu, shaping them in to pieces resembling the ones you use for fish and chips and frying them in breadcrumbs I came surprisingly close to the original thing. Of course it doesn’t taste exactly like fish but the seaweed gives it that fishy feeling that you want to get. I found that I almost liked it more then the original. I am not a big fan of deep fried stuff, and although chips can be nice sometimes (perfect for a hangover day) I think that they can often be too thick, dense and soggy, and just plain potato doesn’t really taste much. I usually roast root vegetables in the oven instead of making chips, and mix up the good old potato with things like carrots, sweet potatoes, parsnips, swedes and so on. Whatever I can find in the fridge at the moment really. It doesn’t just taste better, but also looks really nice with the different colours. I love sauces and of course I felt that my version needed some sauce to go down with it. 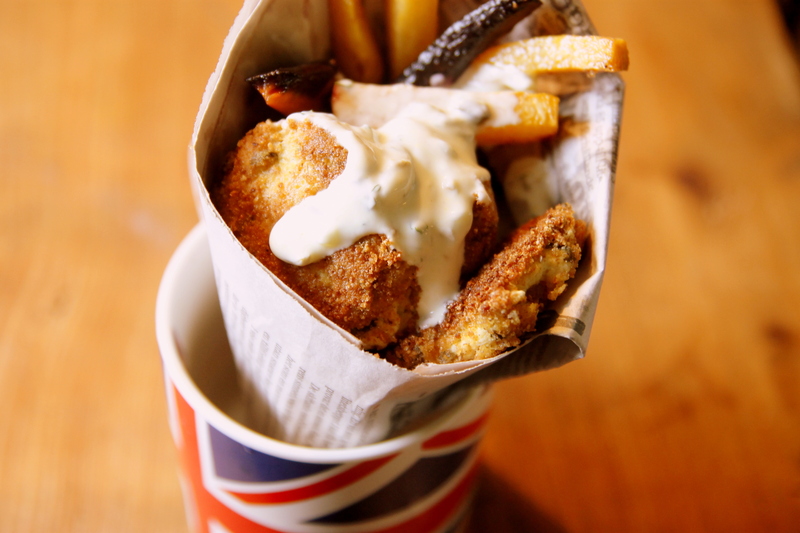 I did some reseach on that kind of sauce that is traditionally eaten with fish and chips, and found the tartar sauce. Funny enough it resembles the remoulad sauce that we have in Sweden. It was always served with fried fish and potatoes in school, and was one of my favourite lunches. I think the tartar sauce is a bit more exciting though, with the addition of strong mustard. I all worked really well together! Soak the kelp or seaweed at least 15 minutes. Mix it in a food processor or with a mixer for around 1 minute. Add the tofu and keep mixing until it is all well mixed together. Season with lemonjuice, salt and pepper. Heat a pan or wide pot with about 2 centimetre of vegetable oil. Shape the tofu mixture in to patties in the size of small fish pieces. Coat the pieces in the breadcrumbs so that it is evenly covered. Fry the pieces until golden brown on both sides. Heat the oven to 200c. Peel and chop up the root vegetables you have at hand. I used potatoes, blue carrots, parsnips and celery root. Drizzle some oil and salt over the vegetables and roast on a tray for about 30 minutes, until they are soft and golden. Mix all the ingredients in a bowl and stir together. Serve the tofe pieces and the fries the traditional way, in pages from a newspaper, or on a plate. 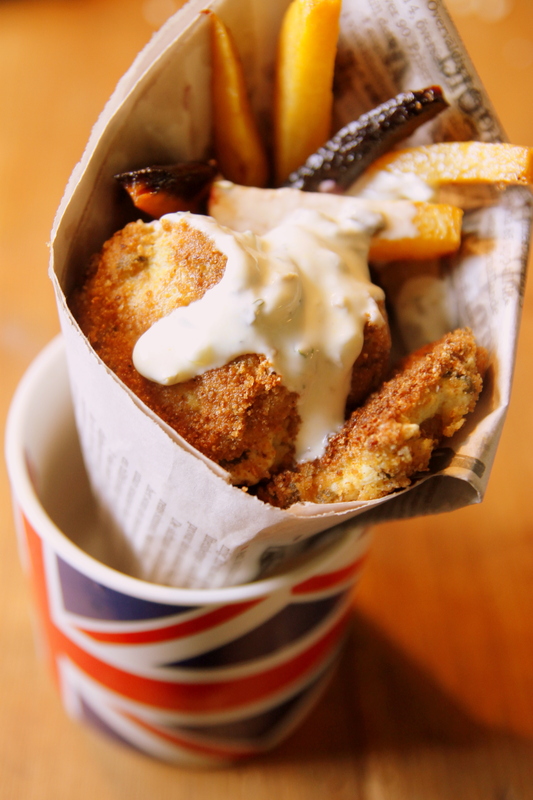 Dont forget to drizzle plenty of tartar sauce over it. anyway, thank you for this wonderful recipe! i’ll be sure to try it. btw, in germany, you can often read “vish” for veggie-fish.